It’s not so important if at the time of his speech Lukashenko already knew that Russia refuses to give Belarus a regular half-billion dollars, or was it simply a guess. Russian journalists focused more on the fact that while criticizing Putin Lukashenko actually said nothing bad about Medvedev. I don’t think it’s time to make fast conclusions about Lukashenko’s return into Russian politics. National-patriotic moods have indeed strengthened in Russia recently. Take for instance a campaign to hunt down the former dissident Alexander Podrabinek, who dared to speak against Soviet veterans and whom Nashi threaten to throw out of the country. But Nashi and other essentially similar patriotic communist and semi-Fascist youth activists are guided by Kremlin. Nothing threatens and by definition can’t threaten the monopoly of Putin’s United Russia. 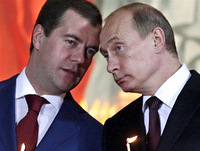 It seems that Putin can’t lose anything to his tandem partner Dmitry Medvedev. Besides, Medvedev with his western habits, fashionable style and love to the Internet somehow misfits the role of a “national leader” and “really patriotic statesman.” Russian electorate can’t even call him “Stalin-soft,” as they refer to Putin sometimes. Of course, it is quiet interesting to watch the fight of “Nanai boys” in Russia and to discuss its possible outcomes for Belarus. But the second part of the problem within Lukashenko’s “rebus” is much more interesting and important (his speech mentioned in the beginning I call a ‘rebus’.) 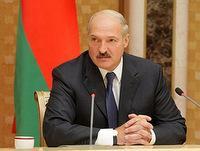 Among other things, Lukashenko has said that Belarus is a European country. The statement means that the country leader still keeps the West in mind. But Lukashenko is not sure if the West will tolerate his tricks and rhetoric forever. This is why he is nervous. This is why he is looking for a way to influence the West indirectly. If Lukashenko is not afraid of Putin, whom many in the West fear, it means that Belarusian leader is confident in his powers and relies on Russia’s protection in any situation. Basket III goes to trash basket? No one knows for sure today, will the European Union finally abolish its sanctions against the government of Belarus, as there is no progress in the task of “liberalization.” The consensus decision-making involves the opinions of all the EU member states and not of a single state like Germany, France or Poland. The West is not Russia. One can discuss the cynicism of the western politicians and Real Politics as much as he wants. But unlike the actions of the Belarusian leader and his Russian partners, the actions of the western politicians can’t be irrational and can’t occur behind the scenes. Democracy has its secret agreements and conspiracies, but their disclosure, or even a suspicion of a plot, costs too much. Let us recall an example of the former German Chancellor and SPD leader Gerhard Shreder, whom his contribution to Gazprom’s financial interests and friendship with Putin cost a political future. At the same time, there never was and, apparently, never will be a common and constant position of the West regarding the human rights in a certain country. Helsinki Accords (which became the basis for further creation of the OSCE) signed by the US, Canada, European states and USSR, contained a so-called Basket III, which included the obligations of all the signers to observe human rights. Some European states – for example, France – looked at the violations in the Soviet Union through the fingers. 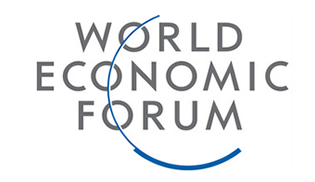 But small countries like Denmark, Holland and Norway as a rule treated the issue more principally. The most fundamental and consistent policy in this regard was traditionally implemented by the United States. 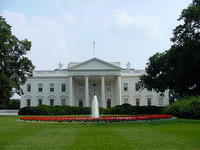 But even there the approaches varied depending on the administration in the White House (i.e. republican or democratic.) Until recently the EU policy towards the new independent states and their democratization differed little from the US policy. This also concerns the policy towards Lukashenko’s regime. But since the beginning of the financial crisis and the “reset” of the US-Russian relations announced by the President Obama, the situation has noticeably changed. A year after Russian aggression in Georgia, the EU put an equal responsibility for starting the war on both Saakashvili and Kremlin. The self-proclaimed independence of Abkhazia and South Ossetia with the creation of Russian military bases there was de-facto accepted by the EU. But the prospects of Georgian and Ukrainian entrance to NATO are dim like never before, despite the fact that the West declares support to these countries. The attempts of the PACE to stop Russian authority within the organization as Russia failed to fulfill any of the conditions of the peace agreement on Georgia ended without a result. So when they speak about recognition or non-recognition of the self-proclaimed republics, can the West demand from Alexander Lukashenko to be holier than the Pope? As to the US, it is clear that their foreign policy is not only the policy of the White House and the Department of State. By the way, nowadays the Department can’t brag about any noticeable success on the international arena. The same concerns the President, who, among other things, failed to defend Chicago’s candidacy for the capital of the Olympics-2016. (Unlike Putin, who as a president achieved the conduction of the winter Olympics-2014 in Sochi.) Since the American Revolution an enormous role was played – and is still played today – by the Congress. Recently the US House of Representatives unanimously supported the continuation of Belarus Democracy Act. Perhaps there are not so many examples of such unanimity of the Democrats and the Republicans in the history of the USA. All western politicians and even men on the streets understand that the might of the western states is based on the separation of powers, independence of representative and judicial bodies, principle of election, human rights and freedom of press. But to the dictators this is not clear at all. Any concession, or even a decision that may seem to be a concession (for example, the refusal to place a missile defense system in Europe) are viewed by the authoritarian regimes as a carte blanche – a cart blanche to suppress opposition, for instance; but not only. At the same time, the relations of the dictatorship with the external world remain as rude as with its own people. All around the world the dictators are guided by the instincts and not by the laws; first of all, they are guided by the instinct of power and political survival. Certainly this is what Ilya Milstein meant when he wrote about the “bestial instincts.” Will the instincts deceive Alexander Lukashenko this time? Soon we’ll know the answer.